Ayse van Lienden is a dental hygienist at East Medford Dental Clinic. 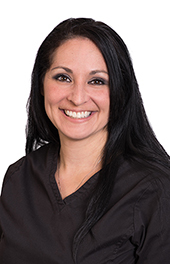 She joined the La Clinica team in January 2018 with eight years of experience, including time as a hygienist in a periodontist’s office and a general dentist’s office. Ayse earned a bachelor’s degree in dental hygiene at Oregon Institute of Technology. Born in California’s Bay area, Ayse moved to the Rogue Valley in 2005. She lives in Medford. She enjoys running (even if not that fast!). She was drawn to La Clinica because she believes the organization truly helps people in exceptional ways.